SmartStep is the Servo system series from Omron and comes with many features. The servo Package comes in different different rated output from 100W to 750W in Flat Servo Motor and from 30W to 750W Cylindrical servo motors. This servo Package name start from R7 and Servo Drive Nomenclature start from R7D and Servo Motor Nomenclature start from R7M. Subscribe to Automation-Talk by Email. 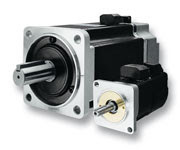 The SmartStep motors offer the simplicity and cost-effectiveness of a stepper with the added advantages of a servo system. It is available in many Sizes like 30W to 800W, rated speed 3,000 rpm. These manuals are in English for other language you can make a request.